WHAT SIZE RING GUARD DO YOU NEED???? Small Size:Will fit a 1.75mm up to a 2.5mm wide band, and for rings size US 5.5 UK size K or larger . Ring guard width is 1.60 mm. Medium Size: Will fit a 2.5mm up to a 2.70mm wide band, and for ring sizes US 8 UK size P and larger. 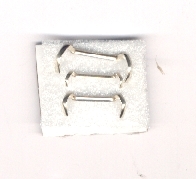 Ring guard width is 2.45 mm. Large Size: Will fit a 2.70 mm up to a 4.50 mm wide band, and for rings sizes US 10 UK size T and larger. Ring guard width is 2.60 mm. Jumbo Size: Will fit a 4.50 mm up to a 7.0 mm wide band, and for rings sizes US 10 UK size T and larger. Ring guard width is 4.50 mm.